As you know, I am in pre-production of the next episode of the Bald Explorer. The idea is to visit six towns across the UK, however, we are starting with one, Bridgnorth. As part of the research for this project, (which we are soon to launch a Kickstarter fund raising campaign), I stumbled across this charming and poignant book. 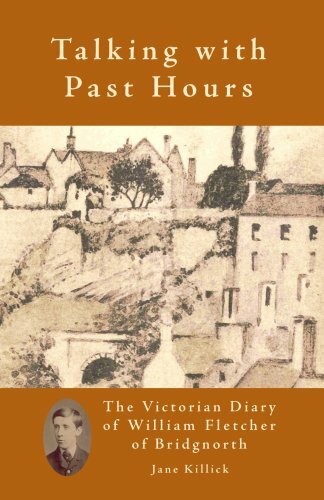 It is the diary of William Fletcher, a resident of Bridgnorth, in Shropshire in the mid 19th century. He is only nineteen when he starts his journal and it lasts but a couple of years. Sadly, by the time he reaches 23 he is dead. The diary records his desire to find love with a young lady called Marianne, the slow decline and final death of his father, the coming of the Severn Valley Railway and his deeply religious beliefs. As he weakens in his own health, we later learn from Tuberculosis – for which there is no cure or inoculations for back then, we read of his visits to various doctors, some obviously quacks, who recommend a whole host of ineffective remedies. His optimism as he tries things like Rotton’s (from Birmingham) Cod’s Liver Oil is heart warming and sad at the same time. From the short volume I have learned much about the Victorian Bridgnorth and the antics of the educated youth, the life style of the young banker (he worked as a cashier in the High Street) and the complete faith of one who believes in God. For me the biggest surprise was the amount of letter writing that went on between William and his parents and his friends, and how marvelous the postal service was back then. We think nothing of sending a text message or an email these days, but it is remarkable to note, that almost the same frequency of correspondence was carried out by pen and ink 150 years ago. The book is available from Amazon, of course, and worth a read if you are interested in something a little different.